The day I felt ugly! by Uzmamd.In breast cancer.1 Comment on The day I felt ugly! I took this photo on the day I was feeling ugly. Yes, I felt un-feminine and ugly that morning. I felt sad. 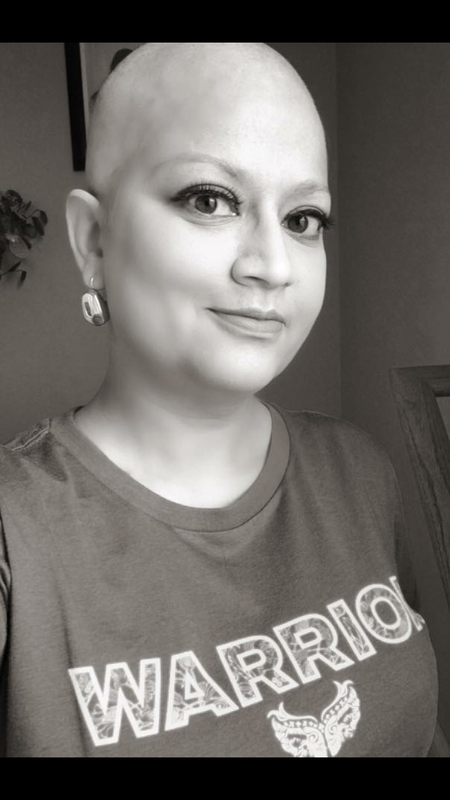 The night before I had shaved a handful of hair still #persisting on my scalp despite two cycles of chemotherapy. I was unsure if I would have hair again in my life time given my diagnosis of stage four incurable cancer. I wondered if I would die bald, I wondered if I was done with having hair forever. With those thoughts , I had grabbed my husband’s electronic razor and shaved my hair off. It needed to be done . Fall had arrived on my scalp and I needed to accept. The next morning I looked at myself, trying to accept that I am bald Again for the second time. My eye lashes were sparse and there was only a faint shadow of my brows. My body that had been used to being toned and fit seemed flabby. All around I felt ugly and undesirable. I thought about the toll cancer had taken on my body and how bit by bit it had stolen from me. In my anger and rebellion , I got dressed, pulled out my make up and started to use it. I put on fake lashes, painted brows and put on bright lipstick . I told myself ” Gosh darn it , even if I feel ugly, I won’t look ugly”. An hour later, I was taking selfies all over the house. Sometimes, it’s not easy to accept life the way it’s unfolding in front of you but I have found that it is necessary to stare back at it and give it a good scare. And yes, I may have felt ugly that day, but I made myself pretty. And yes external beauty is superficial but it does matter or there wouldn’t be a billion dollar beauty industry. I wanted to share this because I want you to know that I am not impermeable and there are many times when I feel vulnerable. I just end up fighting back, getting up and try to fix the problem I face. ” The most beautiful people we have known are those who have known defeat, known suffering, known struggle, known loss, and have found their way out of the depths. These persons have an appreciation, a sensitivity, and an understanding of life that fills them with compassion, gentleness, and a deep loving concern. Beautiful people do not just happen. Here is the picture from the day I felt ugly! You are so, so beautiful with or without hair, with or without makeup and whether you feel beautiful or not. Thank you for sharing your journey and know you have unknown fans hoping for the best for you.